He was born on January 11, 1899 in Monteforte Irpno, son of Antonio Gallo and Angela Picichhhi. He was baptized the same day by Pastor Luigi Campanile in the parish of St. Nicolas from Bari. He was given the names of Vincenzo, Adolfo, Amedeo and his brother Roberto was the godfather. In 1906, the Servant of God receives his First Communion in St. Nicolas Parish at age 7. April 6, 1909, his father dies. 1910 – September 1912, he enters the Apostolic School of Priests of the Sacred Heart in Albino (Bergamo). 1912 – 1915, he attends Junior High School at the Apostolic School of Albino. 1915 – 1916, he attends the first year of High School Guastalla (Reggio Emilia). October 8, 1916, the Servant of God receives the sacrament of Confirmation in Pradalunga by Msgr. Luigi Marelli. Father Peitro Cortinovis was his sponsor. 1916 – 1917, he attends school in Bologna at Arcivescolvile Seminary. August 1917, because of the war, the Servant of God is called to military service in Catanzaro; two months later he is sent home on sick leave because of a cardiac nervous condition. May 24, 1918, he returns to military service and eventually he is discharged on June 19, 1919. June 8, 1919, the Servant of God is accepted as postulate at the Studentanto in Bologna. October 29, 1919, the Servant of God begins the novitiate Albissola. In 1920, the Servant of God interrupts the novitiate because he is recalled to the service from February to June. On January 29, 1921, the dedication to the religious life takes place in Albino, with the dispensation of the Holy See (Santa Sede). He takes on the name of Antonio. February 1921 – June 1923, he attends the Studentato in Bologna at the Regional Seminary Benedeotto XV of Bologna. April 5, 1924, he receives the First Tonsure. October 16, 1924, he takes the perpetual vows in Villa Torano in Imola. December 20, 1924, the Servant of God receives the minor orders of Ostiariato and Lettorato. 1924 – 1925, the Servant of God attends the second course in Theology. March 28, 1925, the Servant of God receives the other two minor orders of the Erorcistato and Accolitato. 1925 – 1926, the Servant of God attends the third course in Theology. 1926 – 1927, the Servant of God attends the forth course in Theology. July 1927, the Servant of God is sent home to take care of his poor health. September 17-23, 1927, the Servant of God goes on a pilgrimage to Lourdes. November 11, 1928, his mother dies. March 1930, the Servant of God is dispensed of his vows because of his grave illness. 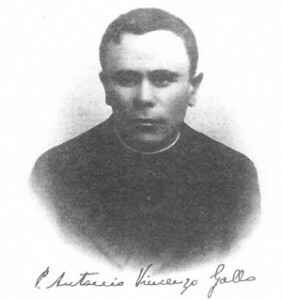 March 23, 1930, the Servant of God is placed in the diocese of Avellino as parish priest. March 1930, the Servant of God is hinged in the Diocese of Avellino. October 8, 1930, the Servant of God is ordained Deacon in the same cathedral of Avellino. December 14, 1930, the Servant of God is ordained priest in St. Nicholas in Monteforte Irpino. December 15, 1930, the Servant of God celebrates his first solemn Mass. March 10, 1931, the Servant of God with permission of the Bishop of Avellino, goes to Rome. March 16, 1931, Father Alessio Roos, with permission of the Father General, calls the Servant of God into Curia of Viale Mazzini as an Oblates to serve in the Parish of Christ the King. May 5, 1934, the Servant of God dies in the Quisisana Clinic where he had been admitted. April 10,1953, the Ordinary Informative Process began in the Vicariate of Rome, and was completed on April 18, 1956. December 29, 1966, the Apostolic Process began in the Congregation of the Causes of Saints, and was successfully completed in 1972. July 15, 1972, the canonical recognition of Father Anthony Vincent Gallo to place at the Church of St. Joaquim in Rome, with a mass celebrated by Cardinal Ferretto. July 15 – October 29, 1972, the bones of the Servant of God, Father Anthony Vincent Gallo, were all placed in the bedroom (cell) of Don Mario Gallo, a Redemptorist Religious Brother and the younger brother of Fr. Anthony. He lived at the Church of St. Joaquim in Rome where the canonical recognition of the body to place. The bones were reverently cleaned by Don Mario personally, they were then joined together from head to toe by silver links – as a Rosary one would describe. Don Mario dressed the body in Fr. Anthony’s vestments that he used to say mass (including his shoes). With donations from the family of David Gallo and his children and spouses, he placed the dressed body in a life size clear plastic sepulcher. The clear plastic sepulcher was then placed into a marble sepulcher located near the main altar of the Church of St. Nicholas, where he was baptized and ordained. The marble sepulcher was sealed on all four sides and placed on a marble pedestal. During masses in his honor, one side of the marble sepulcher was removed so that the faithful could view the body, which in actuality is a first class relic. (See Gallery – Procession and Beatification and Canonization sections for pictures.) Is it possible to comprehend the love Don Mario had for his saintly brother to personally prepare his body for the faithful to ever venerate? October 29, 1972, the body was moved to Monteforte Irpino, the place of his birth, and placed in the Church of St. Nicholas, where he was baptized. April 4, 1973, there was the official closing of the Ordinary Informative Process in the presence of Ugo Cardinal Poletti, Vicar of Rome, and Bishop Venezia of Avellino. July 8, 1975, the Sacred Congregation of Rites officially approved the Informative and Apostolic Processes. January 2, 1976 , was the opening of the investigation of the Sanctity of the Virtues. November 3, 1989, the special process on the herocity of the virtues of Father Anthony Vincent Gallo convened at Congregation of the Causes of Saints by the procurator of Faith, and was successfully completed. April 3, 1990, the Cardinals and Bishops, under the leadership of Guiseppe Cardinal Caprio, recognized that the Servant of God, Father Anthony Vincent Gallo, had exercised the theological and moral virtues to a heroic degree.